The Remote Advanced Playback Unit (RAPU) v5.0 liberates productions from the PC. The RAPU is a plug-and-go replacement for the PC. Take productions and animations perfected on the PC with VSA, upload them to the RAPU via USB, and breathe new realism into the show. The RAPU is the most accurate and advanced solution for production and show control with audio. The RAPU can control up to 64 devices including MiniSSC-compatible servos, Pololu Maestro servos/motors/relays, LynxMotion SSC32 servos/relays, K108A relays, and BoC DMX servos. Or, the RAPU can control up to 128 DMX devices and compatible hardware. The internal clock can be configured to playback routines at predefined dates and times. 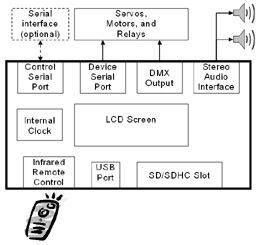 The system can be operated at a variety of frame and baud rates. 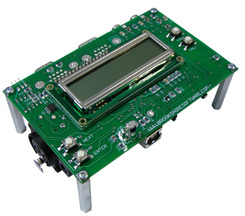 The 4.5” x 3” circuit board can be controlled via its remote serial port, infrared remote control, or from the built in LCD interface. Identical to VSA playback, the RAPU outputs synchronized digital stereo MP3 audio on two RCA jacks. The MP3 audio and device data are stored on a standard SD/SDHC card and can be uploaded to the device through the USB interface. The RAPU v5.0 is fully supported in VSA v5.0 and uses the included RAPU Manager software to upload routines.